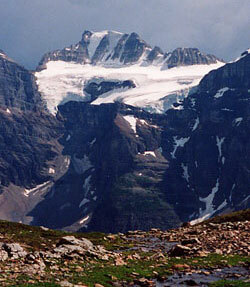 This outstanding peak in the Valley of the Ten Peaks is probably best viewed from Larch Valley where the broad, symmetric peak rises beyond a lovely, high icefield. Professor Charles Fay, a president of both the Appalachian Mountain Club and the American Alpine Club and one of the most distinguished mountaineers of the late nineteenth and early twentieth centuries. 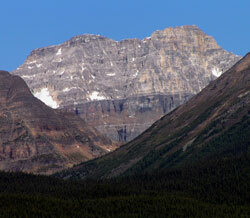 A professor of Modern Languages, Fay was one of a party of four attempting Mount Lefroy in 1896 when P.S. 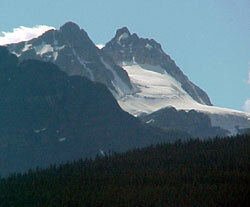 Abbot became the first mountaineer to be killed in the Canadian Rockies. 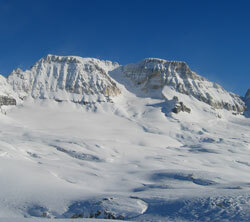 Fay returned the next year to participate in the first ascents of both Mount Lefroy and Mount Victoria. 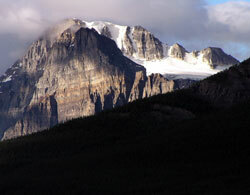 He made a total of twenty-five trips from his home in the eastern United States to climb in the Canadian Rockies. By 1904, when the paths of Gertrude Benham and Charles Fay briefly crossed, the professor was an established mountaineer and had spent several successful seasons in the Rockies. 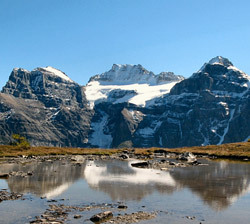 Apparently the Geographic Board of Canada had asked Fay to select a mountain which he would like to be named in his honour. Heejee (Peak #1) in the Valley of the Ten Peaks was chosen and Professor Fay was determined to make the first ascent of the mountain that was to carry his name. 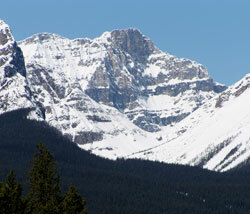 But Gertrude Benham had her eye on this spectacular peak as well. On July 19th she and Christian Kaufmann climbed the icy "Hourglass" couloir between Peaks #3 and #4 and reached a summit which they took to be Heejee. Upon their return to Moraine Lake it was pointed out to them by Walter Wilcox that the mountain which they had climbed was, in fact, not Heejee. The determined Miss Benham and Christian Kaufmann resolved to again ascend the couloir and make the first ascent of Heejee the next day but... Professor Fay and Hans Kaufmann were planning to make the first ascent that day as well. Both parties set out but Professor Fay and Hans Kaufmann found difficult snow conditions and rock fall on their route above Consolation Lakes and were forced to abandon the attempt. Gertrude and Christian were successful. Professor Fay was very annoyed with this turn of events, writing later in a letter to Charles Thompson, "I should probably have made the first ascent on the new Mount Fay which I missed by Hans Kaufmann's leading me, against my protest, up Consolation Valley, while Christian led Miss Benham around the familiar Hourglass Couloir to its virgin summit. Hans alleged that he supposed I had your Mount Little in view! 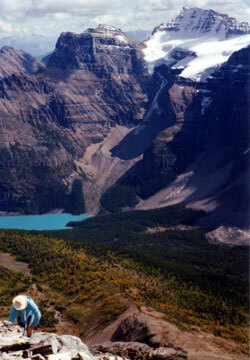 Why did he suppose I wanted to get to it by going around the head of Moraine Lake as I insisted? It is a curious case, however viewed." Disappointed, Fay asked that he be honoured by the naming of a different mountain, and even attempting to have the Kaufmanns fired by the CPR. Whether or not the Kaufmanns conspired to allow the lady to make the first ascent, as they had a reputation for playing jokes, is not known but if they did it is thought that Miss. Benham was an innocent party to the conspiracy. Although the above is a good story, there is some doubt regarding it. In an article published in the 2001 Canadian Alpine Journal, noted author and historian Chic Scott reports that he could find no original documents supporting the fact that the Kaufmann Brothers were practical jokers and may have played a trick on Professor Fay. Then Fay found out that his "alternate" mountain, Shappee, had already been climbed as well, again by Gertrude Benham and Christian Kaufmann. At this point the Professor reluctantly accepted having his name attached to Heejee and completed the second ascent of the peak on August 5th. His guides were not the Kaufmanns, but rather Christian Hasler sr. and Frederick Michel. 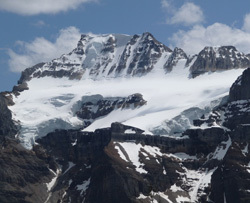 Although Professor Fay did not make the first ascent of the mountain, his grandson completed the first ascent of the northeast ridge of Mount Fay in 1961. 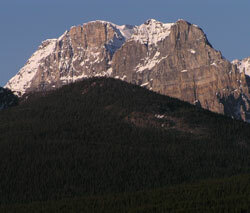 Charles Fay's cousin, Samuel P. Fay visited the northern Rockies, naming two outstanding peaks in the area, Mount Sir Alexander and Mount Ida.